In the midst of a mid-winter road trip this year, I passed through the northern borders of New Mexico. It had been a few years since I had spent any time in the state, but my one and only visit was bewitching. A downright magical trip that left me with nothing but fond memories. True, it was terribly hot and dry when I visited Albuquerque a few summers ago, but a mix of mountains and desert and great food had lured me back during a different season, this time armed with a quiver of winter gear with which to play outside. Which is how I found myself sucking in the oxygen at 9,000 feet, snowshoeing in the ski-prints of Dave Mieras. As manager of Angel Fire Resort’s Nordic Ski Center, Dave oversees all the resort’s skinny ski activities, which includes the groomed trail that circumnavigates the Angel Fire golf course – and the very trail that doubles as the go-to snowshoeing route for resort guests. While the packed corduroy is certainly a good choice for snowshoe-runners, I decided to heed the open call of the forest land and preferred to break trail in deeper conditions, with Dave and a fellow journalist in company. Our destination was a forest service trailhead at the end of a snow-covered road that wound its way through a woodsy community of cabins. 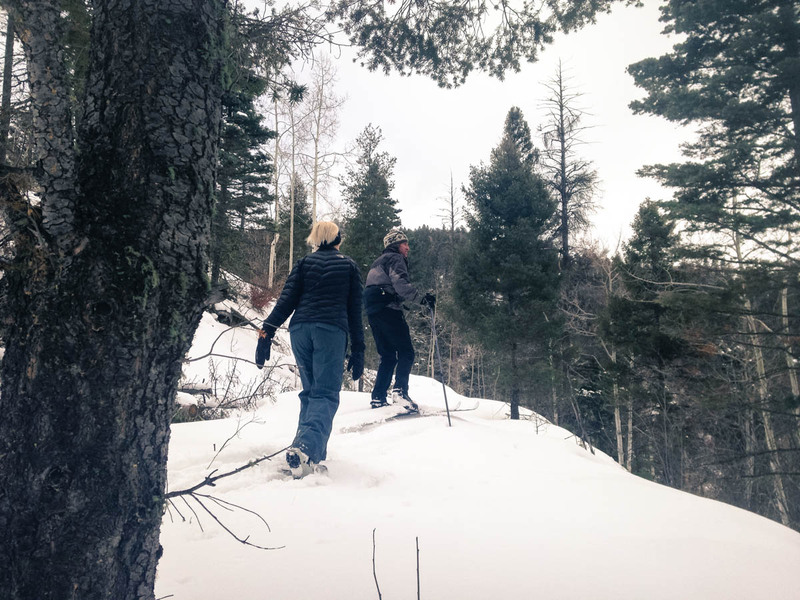 Our starting point would have gone undetectable if it hadn’t been for Dave’s love for these trails, an intimate knowledge he’s developed in the 10+ years of his on-again-off-again time as an Angel Fire resident, Nordic skier and mountain biker. Assuming the role of trail ambassador for the day’s adventure, Dave set us off through the forest entrance, quickly passing from civilization to solitude. The stillness echoed back the soft crunch of our footsteps. Dave’s skinny Nordic skis set the track for our oversized shoes as we followed the contours of a mountain bike trail, preserved by a shallow layer of sugary snow. The snowpack had just enough depth to warrant a pair of ‘shoes. fact, only a week prior, it was unnecessary to bring out any winter equipment to this very trail. A consistent stretch of high-pressure fronts had kept the snow away for weeks, ensuring the trails stayed in a persistent state of thick mud. Before our arrival though, a single storm blanketed the ground and left us with enough snow to grab a pair of shoes and explore a new winter wonderland. But with no base coverage to speak of, an occasional misstep would give way in the rotting, granular snow and sink our snowshoes closer to the ground. Or sometimes, an ill-timed step would catch the snowshoe’s nose in a pile of hidden deadfall or underbrush. The conditions didn’t deter us as we continued uphill through an enchanting ecology of New Mexico’s forest, a spacious combination of spindly pinyon pines, lanky aspen trees and fiery red rock. To call this area beautiful is a blatant understatement. New Mexico’s official state tagline – “The land of enchantment” – seems like an accurate reflection of the very forest we were exploring. Much like the word itself, it was magical, captivating and enchanting without a real understanding why. Nevertheless, it’s a popular phrase to describe the state’s northern environment. Angel Fire – along with Red River Ski Area and Taos Ski Valley – is located in the Carson National Forest, named after Kit Carson, an American-West pioneer and 19th century frontiersman. Together, the ski areas and their surrounding towns make up what’s known as the Enchanted Circle, an 83-mile scenic byway that loops through an alpine tour of mountains, mesas, forests and feldspar. While the scenic drive is doable in a single day’s road trip, the real majesty of the forest is best experienced on foot. And for 1.5 hours, that’s what we did. Of course, our feat was nowhere near the 83-mile loop, but it wasn’t our intention to rack up major distance at Angel Fire. Nor was it necessary. That elusive enchantment returned the instant we set foot on a non-paved trail and began stomping out our own version of a scenic drive. Angel Fire is roughly three hours NE of Albuquerque. 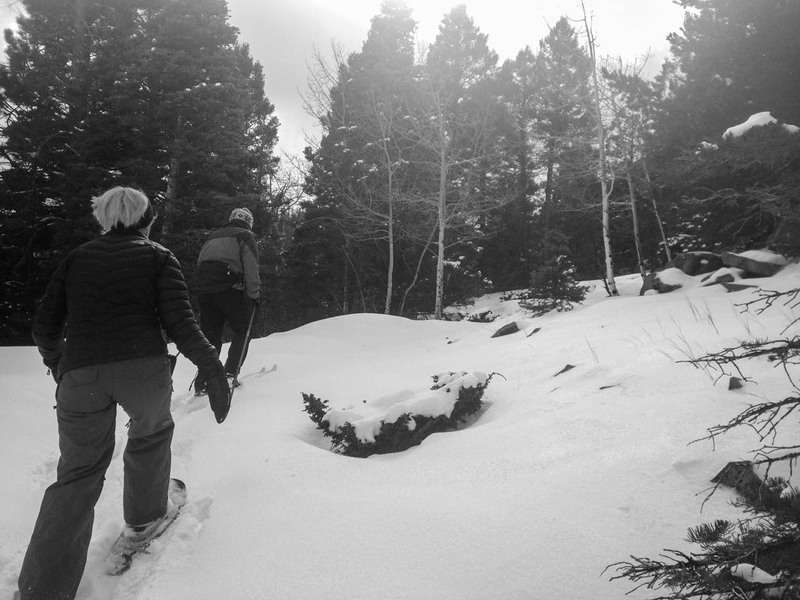 For more information on the Angel Fire Nordic Center, including snowshoe rental rates and trail maps, call 575-377-4320 or visit their website. 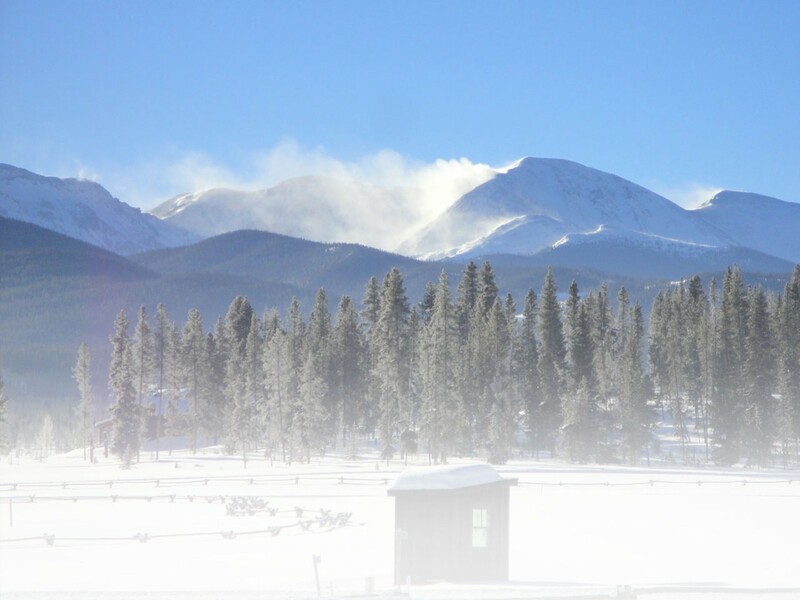 This entry was posted in Destinations, Features, Homepage Featured, New Destinations, New New Mexico, New North America, New Site, New United States and tagged angel fire, new mexico, Snowshoeing, Travel by Stephanie Nitsch. Bookmark the permalink.